The Rut 50K is one beast of a race, boasting more than 10,000 feet of climbing and descending on terrain that included rocky roads, technical single track, and straight up scree fields. 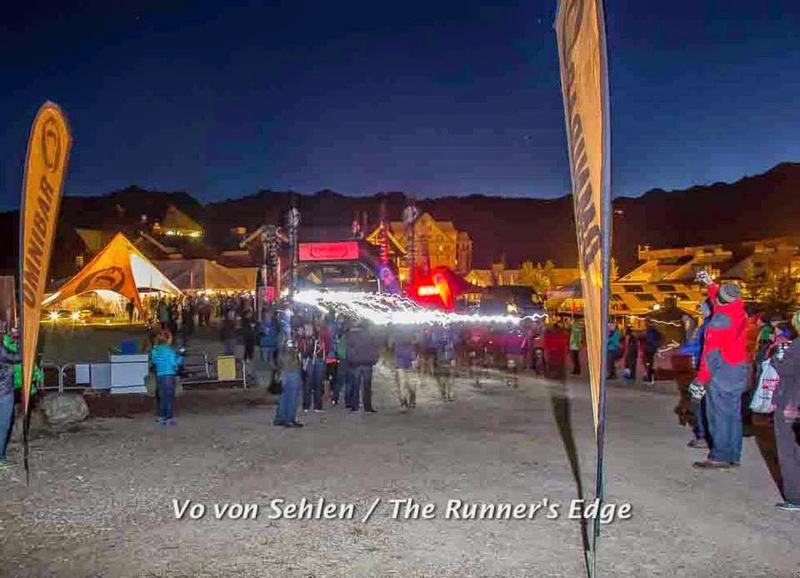 This year, the race was the International Skyrunning Federation Ultra Final, which means that many of the best runners in the world were going to be at this years event. Simply put, the field was absolutely stacked. Here is what iRunFar.com had to say about the men’s field and the women’s field. What am I looking at? Write your best guess in the comments section to win fame and glory. As I stood at the starting line towards the front of the starting line, I was kind of star struck. Almost everyone around me was a pro or sponsored runner, including Kilian Jornet. I was determined to run my own race from the start, because I knew chasing the front of the pack would have been a recipe for disaster. The race started when an elk bugle sounded and we were off into the freezing darkness. The race starts out climbing around 1,000 feet up a ski hill, but I couldn’t tell you much about it because of the lack of light. The first 9 or 10 miles were actually kind of boring, as we wound around rocky service roads and some tight mountain bike single track. It was okay, but not quite what I had in mind for the day. As I approached the first aid station at about mile 7.5, I honestly thought today wasn’t going to be my day. I felt slow compared to other runners on the relatively smooth terrain. I was stiff, gassy, and didn’t feel like I had much pep in me. A little sunlight, caffeine, some positive thinking, and my super crew of Ella and Jenny changed that. Once we got to the first real climb of the day I started passing people and I began to feel optimistic. I made up some ground on all of the climbs and caught up to some strong runners. Many runners gingerly tip toed up and across the seemingly endless scree; the runners that excelled on the smoother terrain before tended to struggle now. I enjoyed all of the rock running, except for when the odd rock flipped up and gashed my shin, sending blood and curse words oozing out. Some of the steep down hills were fun too; one grassy section was so steep I lost traction and started to slide. I dug my fingers into the ground, but it would have taken an ice axe to stop that slide. Eventually I got some traction in the form of more rocks to stop my decent. Another rocky shoot had a hand line in place to help ski down the loose gravel sized rock. All I can say is holy crap I’m glad I put my gloves on before that. Reaching the Tramdock Aid Station at about mile 18 was a highlight of the course as Jenny and Ella had ridden the chairlift up to cheer me on. There is a very short out and back climb at this aid station, so I actually got to see them twice. They asked me if I needed any more water, and I said no, but Ella insisted that I took two 8 oz. soft flasks with me. I thought what the heck and took them. Next was the climb to the summit of Lone Mountain, which is pretty darn intimidating. I had been running with Anna Frost for awhile at that point, and I tried to keep up with her on the climb, but that wasn’t happening today. It was a humbling sight to watch her march up that mountain. Much of the climb was a scramble on all fours and certainly did not resemble running. I felt very comfortable though as I spend a good bit of time scrambling in the Winds. I refueled at the summit, and bombed down the mountain determined not to let the almost un-runnable terrain slow me down. I had vowed not to run out of water again during a race, and I would have again if it weren’t for Ella. As I used all of my agility to descend the long ridge off of Lone Mountain the temperature heated up and for once I was thankful my two-year old is so stubborn. My main bottles were empty, with a couple of miles until the next aid station, the bottles Ella gave me were just enough! Keeping me hydrated: She wasn’t taking “no” for an answer! After descending Lone Mountain the running was pretty straight forward. Single-track and two track that did some climbing and descending. One last climb up a smaller ski hill and I was on the way to the finish. I was hustling down the ski hill when Ellie Greenwood absolutely stormed past me; another impressive runner to see on this amazing day. The finish was fantastic. I felt strong and ran in fast to a rowdy crowd and my super crew waiting for me. What else could I want? It was a great day and I’m glad to have run the rut in 2014. In the end, I finished in 7:03, which was good enough for 44th overall out of 500 runners that started the race. I was pleased to be in the top 10% at a race with such top class competition. Next up? The Bear 100 in on September 26th and 27th. This race has always been the priority, so hopefully I’ve got enough left in the tank! Also, on our way home driving through Yellowstone we saw this giant grizzly swim across a river. Awesome.